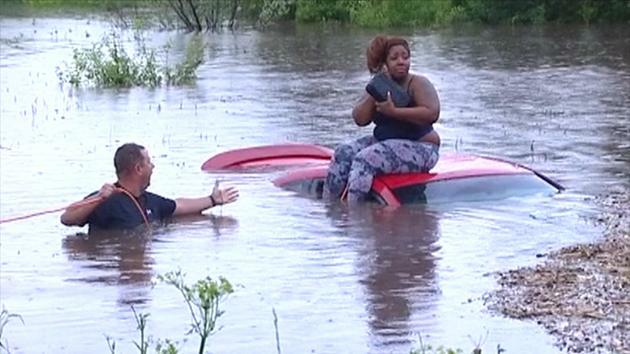 Ear Hustle 411 came across this video Facebook and what surprised us was this lady who is obviously in distress and trapped on the top of her car in some sort of flood and visibly frightened, somehow found talking on her cell phone more important than being rescued. Really??? Is it that serious to stay on the phone while someone is risking their life to save you? A passing motorist helped rescue a woman after she hydroplaned off I-80 near Marseilles. A witness who was driving behind her says the woman appeared to lose control in about two feet of water in a viaduct along the highway. The woman has not been identified. She was shaken by the incident, but is otherwise doing fine.